The Trotternish Ridge on the misty Isle of Skye is a huge landscape of chaotic but very dramatic scenery. 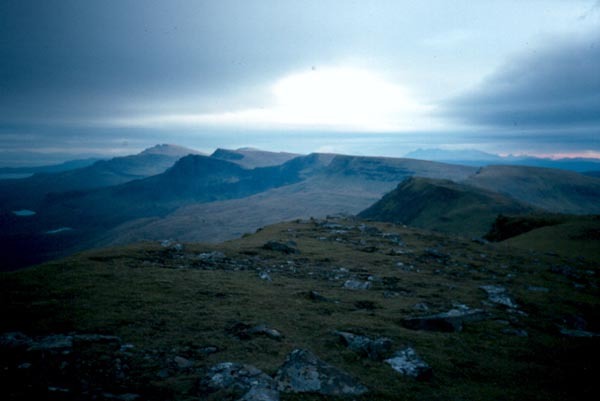 Stretching north from Portree, it provides a challenging 20 mile walk and, although none of the summits stand much over 700 metres, tackling the whole ridge leaves you just as satisfied as the Munro-bagger who has clocked up his or her latest peak. After driving across the road bridge on to Skye, leaving behind us the mainland, we started our holiday proper. I had set off with a friend with the intention of experiencing the triple delights of Skye - the Cuillin, Talisker malt whisky and the Trotternish Ridge. We did the ridge and, of course, the whisky, but the Cuillin will have to wait another day! We reached the island capital, Portree, by mid afternoon and after stocking up with some last minute supplies, we headed north on the road to Staffin, just as far as a string of bungalows a mile or so out of town. With permission from one of the owners, we parked our car by his B&B and set off on foot for the most northerly tip of the island. 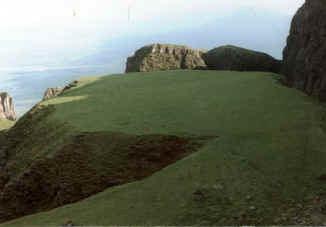 We began at Achchork but it is also possible to hit the ridge from the west shore of Loch Fada, several miles further up the Staffin road. Whatever you decide, the first main port of call is the summit of A Chorra bheinn, a baby of a hill at only 459 metres. The climb started gently enough but the gradient became steeper as we neared the rocky top. Like the whole ride walk, the route is over open hillside, through a deep pile carpet of tussocky grass, heather and boulders. Once on the top, however, our endeavour was rewarded with stunning views, a feature that continues throughout the hike. Descending north over open moorland and peat bogs, the route heads out towards the edge of the ridge which becomes more pronounced from here on to Ben Dearg, slightly higher than the first top at 552 metres. It was a more gradual climb which came as a relief after the initial uphill stint, providing an opportunity to break in feet which had earlier only had the brake, clutch and accelerator pedals on the car journey up for exercise. On this route no sooner do you go down one slope than you are faced with another uphill struggle, usually more daunting than the previous one. From time to time a narrow track emerged from the heather, but there is no definite path along the ridge. In good weather it is easy to follow the rocky cliff top but you need to be careful in poor visibility - one wrong step and you could be taking the fast route to the bottom! From the top of Ben Dearg, the walk heads away from the main ridge, east to Beinn a'Chearcaill. It is worth going out west towards the end of the spur here to avoid a steep and craggy descent from this top. Once down, we set a course back to the ridge, following it north. Below, to the right, sits Loch Fada and Loch Leathan. Both feed Skye's small hydro electric power station. Looking ahead, we could clearly see the mighty Storr which, at 719 metres, is the highest point of the ridge walk. 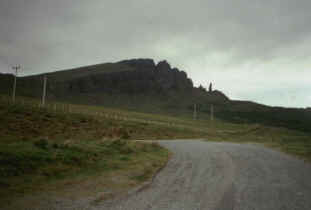 Below is the Old Man of Storr, a 50 metre high pinnacle of rock which was first climbed in 1955. Formed of rock and decomposing basalt lava, it is a fragile but spectacular sight. We decided that as fragile as it was, The Storr and its old man could wait another day for us. We pitched out tent near the edge of the cliff, in the shadow of Ben Dearg, and watched the sun set on our first day. The ridge is ideal for camping with plenty of flat ground and a good supply of running water a little way down the slope in the tiny burns which eventually find their way down to Loch Snizort. After breakfasting in the rain the next morning, we tackled the climb up The Storr. Starting gently, it seemed to become steeper and steeper as we became more and more tired. So often the way first thing in the day! The top of The Storr, which boasts a trig point, mirrors the entire ridge walk in its terrain. To the west the hillside is smooth and rolling, while to the east it is craggy and steep with a sheer drop into the rocky cauldron from which the Old Man protrudes. On we went. The route dipped and, with the sun making a rare appearance, we marched on with a spring in our step, over the top of Hartaval, located on the edge of the ridge, to the spot height at Creag a'Lain. Along the next stretch of the ridge there are generous views over the Atlantic Ocean. Below the ridge here are the remains of a narrow gauge railway which transported ore from a site on the edge of Loch Cuthir to a processing plant and landing stage at Invertote on the coast. The walk levels out a little towards the next major top, Beinn Edra (611m). Rather than face a tough climb first thing the next day, we decided to get it over with now before striking our second night's camp. Beinn Edra is a fairly demanding little climb and the trig point, standing proud on the stony summit, was a welcome landmark when it came. It had begun to rain heavily and, combined with a plague of midges, our descent was less than pleasant. It improved in the evening, though, and we were treated to delightfully moody panoramas over the sea, admired from behind the safety of the tent's mesh door. The following morning the weather had improved little and the damp, clammy conditions enticed the midges out again. In a black cloud of buzzing insect life, there were expletives galore as we rapidly dismantled the tent, threw the various damp bits into our rucksacks and hurried off. We were not prepared for what was next on the agenda: a blisteringly steep ascent of Bioda Buidhe. The sun was out now and the heat conspired with rough underfoot terrain to produce less than pleasant humid conditions. After a fair degree of sweat and toil, we overcame the giant obstacle and tramped down to the Staffin to Uig road which bisects the ridge. There's a car park here. 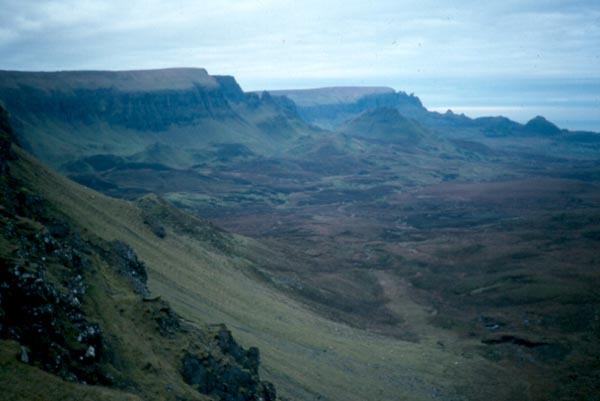 Across the tarmac, a small path heads north under the crags and, although a little precarious in places, it leads a straight course to a rocky pass called the Quiraing, about a mile on. 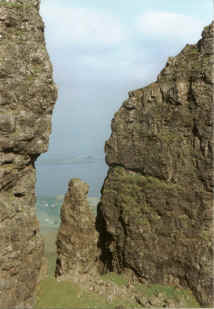 A detour up the steep slope (there is a path) takes you above a pinnacle of rock known as the Needle. Follow the path up through a narrow but steep and slippery gateway in the rock and keep with in until you come out on a flat grassy plateau called the Table. This is about the size of a football pitch but any game would be marred by the fact a ball kicked out would have to be retrieved from around a hundred feet below. After our visit to these wonders of geology and landform, we returned to the car park on the Staffin to Uig road and climbed on to Meall na Suiramach (543m) and continued to Sgurr Mor (492m), the final great lump of rock on the Trotternish Ridge. From there, we descended over open moorland to Duntulm where the ruins of an historic cliff top castle make a perfect finishing post. WALK FACTS - Distance: 20 miles/30km. Map: OS Landranger 1:50,000 sheet 23. Start: Achchork on the northern outskirts of Portree (grid ref 481458). Grading: A long two-day walk over rough terrain with plenty of ascent. Route finding is easy in good visibility, but in bad visibility take great care as the east side of the ridge is very steep and potentially very dangerous. There are numerous points of escape from the ridge - the majority on the west - should you wish to get off in a hurry. 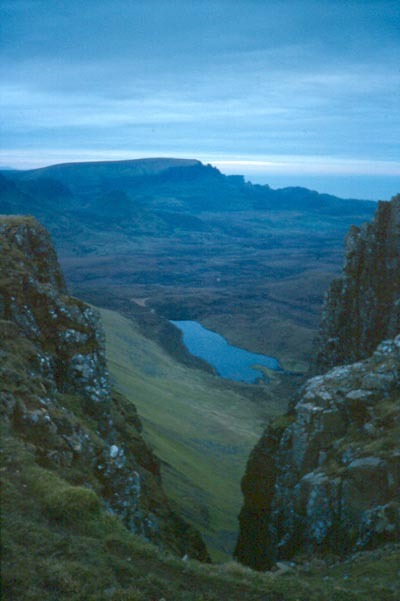 On the east side, safe descents can be made from The Storr (where a path leads down) or via the Uig to Staffin road. Accommodation: Nothing on the ridge, so a tent or bivibag is required. B&Bs are to be found off the route at Portree, Broraig, Flodigarry, Staffin and Duntulm. There's an SYHA hostel at Uig, five kilometres by path and track west of Beinn Edra. For accommodation bookings, contact the tourist information centre in Portree (Tel 01478 612137).